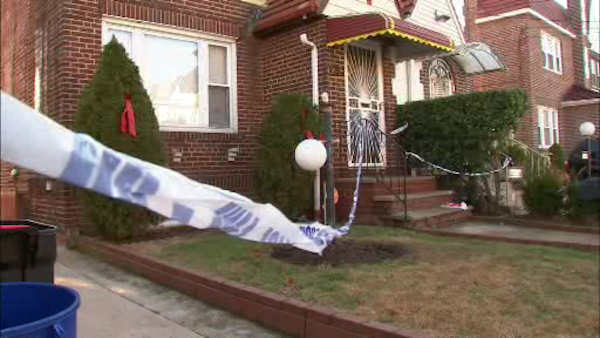 LAURELTON, Queens -- Police say a man stabbed a woman and a 17-year-old before fatally shooting himself inside a home in Queens Wednesday night. The 46-year-old man allegedly stabbed the 37-year-old woman, who is possibly his girlfriend, multiple times in the face on the first floor of the 227th Street home in Laurelton around 11:30 p.m. Authorities say he then stabbed a 17-year-old once in the right shoulder. The two victims reportedly grabbed a 4-year-old child, who was not injured, and barricaded themselves inside a second-floor bathroom. When officers responded, they say the man shot himself in the head. He was pronounced dead at Jamaica Hospital. The victims were also taken to Jamaica Hospital, where they are in stable condition. Detectives are investigating the stabbings as the result of a possible domestic dispute. A gun was recovered at the scene.